Following the defeat at Bull Run, Lincoln appointed George B. McClellan as the commander of the army. He quickly set about improving the army. The troops were drilled, equipment was improved, and soon the newly christened Army of the Potomac was a fighting force second to none. The troops admired McClellan and the press dubbed him “The Young Napoleon.” Despite organizing such a formidable force, McClellan was hesitant. Prompted to act by Lincoln, McClellan decided not to advance on Richmond directly. Instead he devised a plan to ship his army to the peninsula between the York and James Rivers. From here he would advance westward toward the Confederate capitol. Following the battle of Seven Pines, during which General Joseph E. Johnston was wounded, command of the Army of Northern Virginia fell to Robert E. Lee. 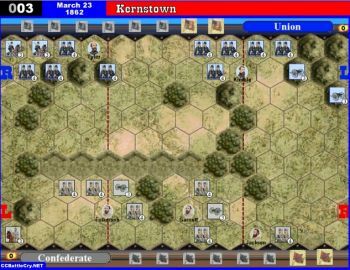 He decided to attack and drive the Union forces from the vicinity of Richmond. The series of engagements to follow became known as the Seven Days Battles. 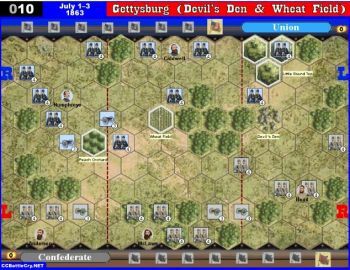 The first attack at the Battle of Mechanicsville did not go well for the Confederates, but McClellan decided to withdraw. The next day Lee attacked again. Porter occupied a new defensive position along Boatswain Creek. The Confederate assaults made little headway against fierce and determined resistance. 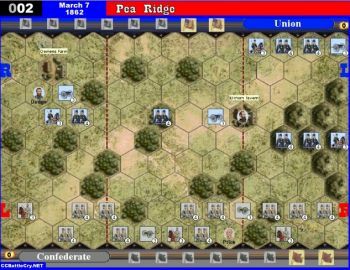 At 7 p.m., Lee ordered an all-out assault on the Union positions. 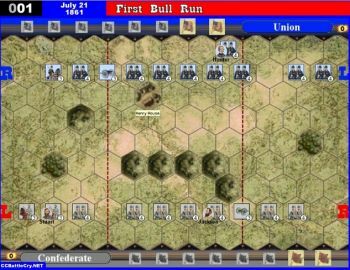 At first, the Union line held against the renewed attacks, but then crumbled in the center when one of A. P. Hill’s brigades broke through. 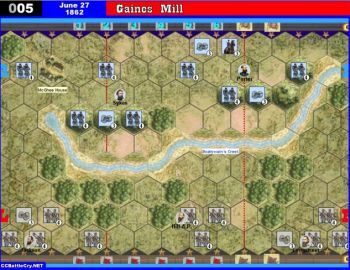 Gaines Mill was the most costly of all the Seven Days Battles, with Lee losing almost 8,000 soldiers. Played this scenario with my nephew last week. 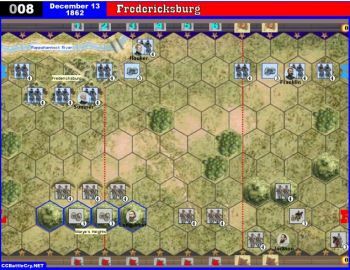 It turned into a bit of an artillery duel, despite the copious woods for the infantry to hide in. 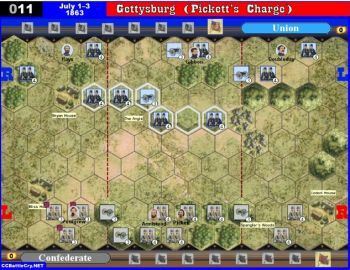 And, with three artillery units to their opponents' two, the advantage was with the Union. 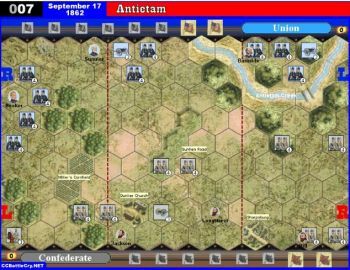 I did get some Confederate infantry past the end of the river to outflank the Union line, but Tom sprinted some troops across from the centre to get the final banner and win 6:3. 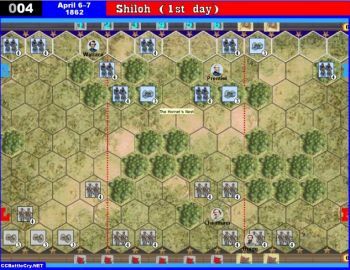 Swapping sides, the battle was again an artillery duel. 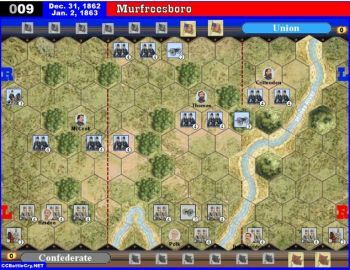 Every time Confederate forces advanced, the Union artillery forced them back. The result was pretty one-sided. 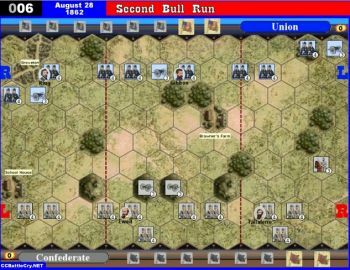 I had worked the one cavalry unit over to my right flank, hoping to get behind the Confederate line and mop up damaged units, but it wasn't necessary. 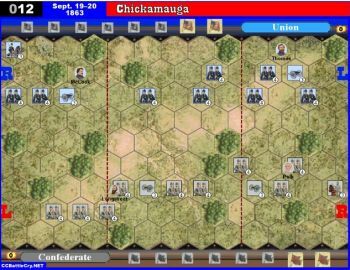 A second Union victory, but by a bigger margin: 6:1, giving me the win on aggregate 9:7.